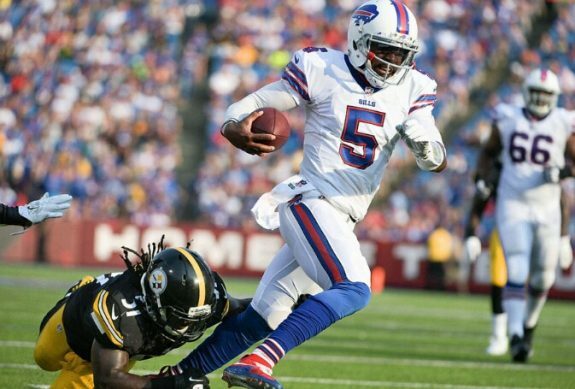 The Pittsburgh Steelers headed into the third week of preseason knowing that the Buffalo Bills have been building a potent offense of their own. With a suspect defense, the Steelers struggled, losing by a score of 43-19. Quarterback Michael Vick had a decent showing in his Steelers debut. With help from Martavis Bryant, Vick was able to move the offense efficiently. He still had enough zip in his legs to take off on one play down the sideline. The real story of the day was that the Steelers played nearly every man they had in their defensive arsenal against the Bills – a Buffalo offense that put in four different quarterbacks, lost several players to injury during the game and did not play their top receivers – and had no real answers. The Bills were able to throw passes at will, further exposing deficiencies in the Steelers defense that had trouble with the run initially and got caught playing too soft on pass coverage. Watching Steelers players over-pursue and miss tackles just added more worrisome concerns. It is no longer acceptable to simply say, ‘it’s preseason’ and buy into the excuse. The Steelers have just one game left to work out the kinks and after being handed the loss on Saturday, there may not be enough irons to smooth the wrinkles. 3 Comments on "Steelers defense can’t contain Bills"
Overall observation of this game is really simple . The starting offense looks good . The starting defense is a train wreck and thats being very kind . Needless to say the biggest question coming into the 2015 season was the effectiveness of the defense . That question has been answered loud and clear . 2015 is going to be a long year . There has never been an offense so good that it can score more points than the defense can give away. The score in this preseason game is meaningless. What we can deduce from this exhibition is that the D-line cannot stop the run and the secondary cannot stop the pass. From the first string defense to the fourth quarter scrubs, the Tampa 2 or zone or whatever they call this defense is not working. I have opined before that we simply do not have the talent for it. Nothing in this game inclines me to change that opinion. Admittedly, many who played in this game will not make the 53-man roster. But when the first team defense cannot execute the scheme, there is something fundamentally wrong. When all four opposing QBs — none of whom is headed for the HOF — complete passes virtually at will against our defense, there is something fundamentally wrong. Since Tomlin personally is helping to coach the secondary, the responsibility for this ineptitude must rest with him. And somewhere in Nashville tonight an old coach is allowing himself a wry smile. Tomlin wanted control of the defense so LeBeau is out! How’s that working for you Tomlin. You used the excuse every year that the team is in transition, so with the LeBeau firing, that must add a few more years on to the 9 years you have had this team in slow decline!